A printable fact sheet about Maneki Nekos (Japanese Lucky Cats). Seriously awesome: who doesn’t love Lucky cats? I collated information from several different websites to create this fact sheet to use in a lesson on Japanese culture. It includes the instructions on how to draw lucky cats, shamefully stolen from this website: http://www.dragoart.com/tuts/8904/1/1/how-to-draw-lucky-cat,-maneki-neko,-lucky-cat.htm and general (and very basic) about the symbolism of different types of Maneki Neko (derived mostly from http://donaldmoon.tripod.com/neko/index.html). As part of the Australian National Curriculum, Year 8’s can cover Shogunate Japan (the Edo period) in History. 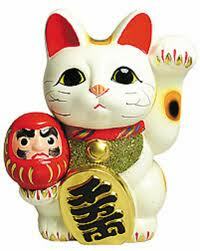 The Maneki Neko originates in the late Edo period to Meiji period. The idea is students will either draw their own Maneki Neko or colour in a template, choosing the style and symbols which are important to them; and potentially learning a bit about Japanese culture in the meantime. Update: I’ve since delivered this task two times. Students seem to really love it!